Kalyan Dombivli Sports Complex INCLUSIVE GAMES + EXCLUSIVE SPORTS Ethos for Exclusive Sports – It shall be a comprehensive, international sporting complex in the heart of west India. The complex shall attempt to breed sporting champions for the district, state and the country. Locally, it shall expand the social and health infrastructure of its neighbourhood and the city. It caters to the region’s evolving demography + institutional population as a lifestyle destination. Its existence shall expand on the existing sports infrastructure of the region in addition to becoming an urban landmark, formally and functionally. Ethos for Inclusive Games – The performance of the complex is not reliant only on a membership based model. It also offers a casual experience. 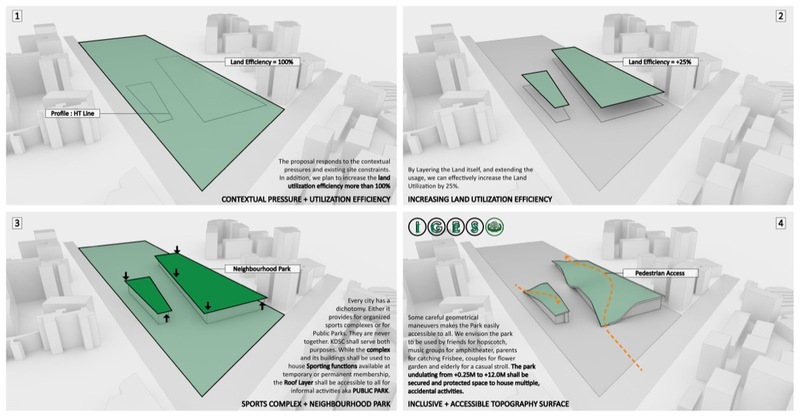 A comprehensive Roof Layer functions as a Neighborhood Park. It shall be free, it shall be secure, it shall be playful. We envision it to be used by kids, tweens, couples, music groups, lecture societies, laughter clubs, elderly strollers and many such generic usages. In addition, the proximity to Sporting arenas shall imbibe enthusiasm and interest in organised sports. 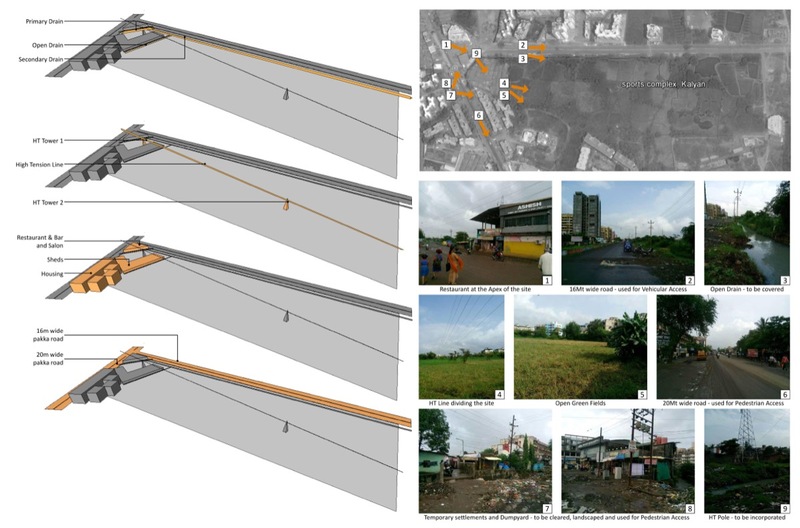 OMNIPRESENT GREEN The Proposal shall be a comprehensively sustainable complex. Orientations, Roof Insulation, Water + Soil Treatment, Facades, Solar Panels, Rain Water Harvesting and many more considerations are made to ensure that the foot print is minimal. By Layering the Land itself, and extending the usage, we can effectively increase the Land Utilization by 25%. Every city has a dichotomy. Either it provides for organized sports complexes or for Public Parks. They are never together. KDSC shall serve both purposes. While the complex and its buildings shall be used to house Sporting functions available at temporary or permanent membership, the Roof Layer shall be accessible to all for informal activities aka PUBLIC PARK. Some careful geometrical maneuvers makes the Park easily accessible to all. We envision the park to be used by friends for hopscotch, music groups for amphitheater, parents for catching Frisbee, couples for flower garden and elderly for a casual stroll. The park undulating from +0.25M to +12.0M shall be secured and protected space to house multiple, accidental activities. The Proposal has 100% Soft-scape + 100% Green. The loss of natural land owing to construction is replaced by providing the same land on the roof. Local plantation of shading, fruit and flowering trees add to the vibrant experience. The water fountains within the plaza lower the ambient temperature. In addition, the profiles of the buildings cause a wind tunnel effect. Solar Panels on the roof cover for the 100KW requirement of the outdoor lighting. The sustainable Canopies are designed for water harvesting and solar power generation too. STP take care of soil generated and the treated waste is used for irrigation and manure. Since, the stadium shall be for the local populous, we don’t suggest an embargo on the circulation. However, there shall be control over the playing arenas. Temporary or permanent passes / cards can be issued to members which can be topped up from time to time. Non-members can experience the complex by limiting themselves to free zones such as parks and playpens. The success of the project shall be in collaboration with the designers and the management. The complex shall be 100% pedestrian friendly with restricted entry to vehicles. Service vehicles can operate within the plaza and setbacks. True to its intent of Inclusive Games, Exclusive Sports, KDSC is envisioned to provide an extremely active infrastructure. The limitations of the HT line are used to design the Spine (the plaza) of the complex. This Plaza is activated with various landscape elements and the 200Mt track. The plantation + landscaping elements, in addition also reduce the ambient temperature.